Sugar exports from Ukraine since early 2016/17 agricultural year (September-August) totaled 732,000 tonnes, the Ukrtsukor national association of sugar producers has reported. The association said in a press release that in May Ukrainian companies exported 48,400 tonnes of sugar (33% down on April). "In May sugar exports almost halved compared to April, as the global price fell. According to our estimates, further supplies of sugar this agri-year will be small," Head of the analytical department of the association Ruslana Butylo. Largest batches in May were shipped to Togo (15,000 tonnes), Turkey (8,800 tonnes) and Gambia (8,000). The association said that sugar beets were sowed on 310,000 ha in 2017 (6% more than a year ago). 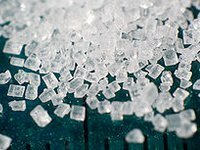 Ukrtsukor anticipates that sugar production in 2017/18 agri-year will be left unchanged compared to the previous year, being some 2 million tonnes. Bad weather in April and May could affect the sugar beets yield. Exports of sugar in the new season could be some 500 tonnes with the domestic market consumption of 1.5 million tonnes.